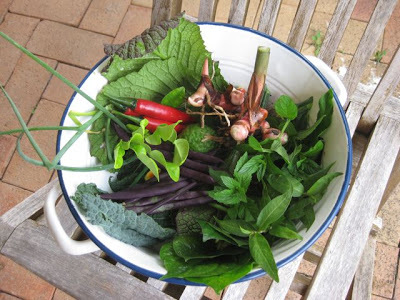 One of the fantastic things about living in the sub-tropics is being able to grow your own spice garden – ginger, chillies, kaffir lime, lemon grass, betel leaf, curry leaf, turmeric, coriander, cinnamon, Thai basil, Vietnamese mint, bay leaves, galangal, macadamia, pandan, lime, lemon – and they also make terrific landscaping plants too! This is a recipe based on one that I picked up in one of the cooking classes that I took in Bali many years ago, with Janet de Neefe from Casa Luna Cooking School, and it has been a staple in my freezer ever since – usually at this time of year when the galangal is ready for harvesting. 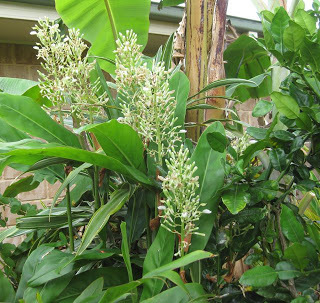 You use the root rhizome – it looks like a large, pink ginger. It’s best to use the young shoots that are still pink and choppable – as it gets older it gets woodier. The aromatic leaves can also be used to wrap food before cooking on the barbecue – especially fish. NOTE August 2017. 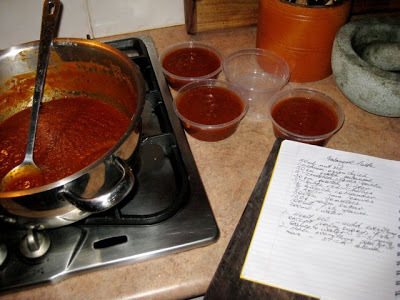 I originally wrote this post in 2012 – and there I was again last night, cooking up prawns on betel leaves with some of this yummy paste that I had in the freezer – not the same batch from 2012! 1. One tablespoon of the galangal paste is great mixed with pumpkin/sweet potato/cauliflower with some coconut cream added for an instant curry VEGETARIAN CURRY. Made even more delicious with a handful of toasted cashew nuts and some chopped fresh coriander. 2. One of my favourites ways to use this paste though is with fresh prawns or a nice piece of fresh, fleshy white fish to make a simple curry. For this I just flash fry the fish/prawns with extra garlic, fresh chilli and add one tablespoon galangal paste with a small can of coconut cream. A little extra salt and a few fresh kaffir lime leaves and it’s done in about 10 minutes. 3. Also great with a tablespoon added to stir fried green beans with a freshly topped tomato, 1 clove garlic and a little sliced red chilli. Top with some toasted, crushed macadamias/almond flakes. 4. 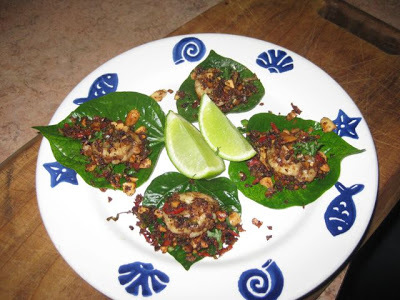 Betel leaf grows easily around here and a spoonful of galangal paste added to some stir-fried prawns and topped with chopped peanuts or toasted coconut, coriander, chilli and lime juice make a great appetizer. 1. Heat oil – add everything except palm sugar, fish sauce and water. Cook for 5-7mins. 2. Add palm sugar, fish sauce and water and simmer for about 30 mins until oil comes to surface. Stick blend. 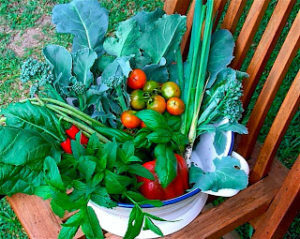 Now what could be easier than that – with most of the fresh ingredients coming from the garden?!! 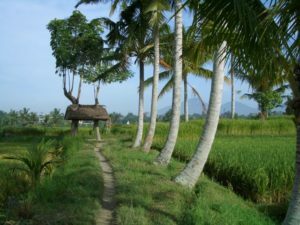 And, just because we can, just a little walk in the rice fields around Ubud with the mountains of Batur and Agung in the distance.